LES Labs is nutritional supplements brand that aims to supply people with the nutrients they need. LES Labs prides itself on using science as a guide and creating supplements that truly help the body. With Big Apple Buddy’s personal shopping service, you can now buy the products from the USA LES Labs online store anytime, anywhere. Suffer from seasonal allergies? LES Labs has a supplement for that. 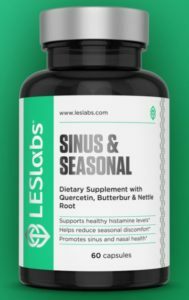 The Sinus & Seasonal formula promotes sinus, nasal, and respiratory health and reduces seasonal discomfort. LES Labs has you covered from head to toe—including your hair! 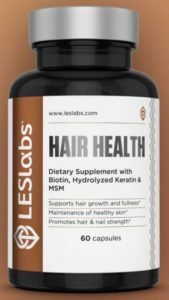 Hair Health is a dietary supplement that strengthens hair and supports hair growth. On top of that, it will strengthen your nails and skin. LES Labs also cares about supporting your emotional health, not just your physical health. 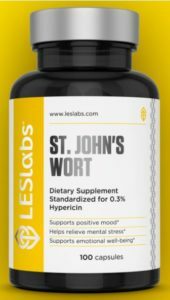 St. John’s Wort will improve your mood and relieve stress. Ashwagandha will help your body respond to stress and support physical endurance and recovery. Check out the USA LES Labs online store to see all the supplements the company offers for all your health needs. The USA LES Labs online store unfortunately does not offer international shipping. Not to worry though! Big Apple Buddy, your personal shopper, can help you buy products from the USA LES Labs online store and ship them to your doorstep, no matter where you are in the world. We offer international shipping to over 110 countries including Australia, Austria, Azerbaijan, Bahrain, Belgium, British Virgin Islands, Brunei, Bulgaria, Canada, Chile, Costa Rica, Croatia, Czech Republic, Denmark, Estonia, Fiji, Finland, France, French Polynesia, Germany, Gibraltar, Greece, Greenland, Hong Kong, Hungary, Iceland, Indonesia, Ireland, Israel, Italy, Japan, Jordan, Kuwait, Latvia, Liechtenstein, Lithuania, Luxembourg, Macau, Malaysia, Maldives, Malta, Marshall Islands, Mauritius, Monaco, the Netherlands, Netherland Antilles, New Zealand, Norway, Oman, Poland, Qatar, Romania, San Marino, Saudi Arabia, Serbia and Montenegro, Seychelles, Singapore, Slovak Republic, Slovenia, Spain, South Africa, St. Lucia, Sweden, Switzerland, Taiwan, Thailand, the UAE, the UK, Vatican City, and Vietnam. If you would like to buy from the USA LES Labs online store, simply let us know which items you would like to order (by filling out the form below) and we’ll get back to you with a free international shipping quote within 24 hours!